Man, Wo-Man, and Little-Man of Aran. For those without comedic tastes, the so-called experts at Wikipedia think they have an article about Aran Islands. The Aran Islands (Irish: Oileáin Árann) or The Arans are three large slabs of rock located at the mouth of Galway Bay, on the west coast of Ireland. They are pelted every day with rainstorms, enormous waves brought upon by the rainstorms, and struggling poets come to look upon the enormous waves brought upon by the rainstorms. It has no natural vegetation, soil, or clean water, plus a terrifyingly small supply of naturally occurring oxygen. For these reasons, the islands are revered in Irish culture, and many dozens of thickly-accented peasants call the big rocks their homes. Inishmore, the largest Aran island. 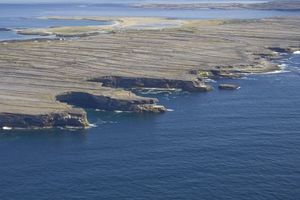 Three enormous pieces of limestone make up the Aran Islands, their enormousness decreasing as one travels west to east. They are found stranded in the middle of the Galway Bay (or "Galbay" for short), which pummels the island daily with foamy waves and wavy foam. Each island is composed of solid limestone, with some dirt and patches of grass sneaking into the cracks like brave weeds sprouting in the margins of a filthy city street. Seaweed is the main currency of the Aran Islands due to its plentiful nature, with otherwise commonplace items such as wood and dirt functioning as luxury goods. The exchange rate between buckets of seaweed and clods of dirt in 2005 were 5 : 1, though the 2008 recession has since inflated the rate to 8 : 1. Local peasants rely on food and supplies imported from Galway to survive, creating a parental mentality among residents of the mainland city over the years. They subject the islands to monthly inspections, making sure each peasant has enough resources to barely sustain them day-to-day and stays away from alcohol and recreational drugs. An unsatisfactory inspection used to be punished with forcible eviction from the islands, though the obvious benefits of eviction have since rendered the punishment obsolete. It is now more common for residents to suffer a "grounding," forcible placement in the corner of the island with no seaweed supper for two weeks. Inishmore is the largest, and westernmost, of the Aran Islands. Its almost completely flat surface makes it ideal for bicycling, though the abrupt 40 foot cliffs around the island's circumference make it ideal to invest in quality brakes. Being the largest of the three islands, it is the most diverse and well-populated island by far, housing over thirteen types of impoverished Irishman, eight types of impoverished Irishwoman, and over eighty-nine different types of rocks. Inishaan, the middle (or "Marcia") Aran island. Inisheer always gets to sell their seaweed to Galway for extra nickels, but when Inishaan tries to do the same, they get told "Don't you think you're a little too big for this?" Inisheer always gets molested more often. Inishaan finds this slightly disturbing. Inisheer, the smallest Aran island. Inisheer, the littlest island, functions as the cultural center for all of Aran, hosting several festivals on pivotal dates each year. Lá Uafásach, a tremendous feast of edible-looking rocks on the Summer Solstice, is celebrated to ease into the fallow period that plagues the Aran Islands from July through May. A similar festival, Réabhlóid Dúnmharú Léidearnach Thointrí, takes place on December 16th, at the peak of the third starvation cycle. A wide variety of games are played to distract the population from their dead or dying children, such as Maraigh gach ceann eile le carraigeacha ar an ceann, a feat of strength, and Caith do leanaí i aigéan, a disposal of said dead or dying children. Written history of the Aran Islands did not exist until the 17th Century, when the first tree was imported from neighboring Galway, subsequently processed into paper using a paper processor imported from Galway, and written upon using a pen imported from Galway. Archaeological remains suggest that the island was populated sparsely by Celtic Druids pre-1600, though nothing is known about their culture spare that they starved and died off, as was popular in Irish society at the time. 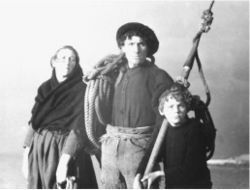 During the 14th Official English Oppression, the Aran Islands were re-settled by refugee Catholics from Eastern Ireland. The British gave the poor peasants two options: "Go to Connacht, or go to Hell;" naturally, the fleeing citizens stumbled upon Aran en route to Hell. The Anglican army considered extending their oppression to Aran, but a quick view of the big limestone rocks from across the bay convinced them otherwise. When the Irish regained control of their homeland after the brutal Land War some centuries later, a team was sent to Aran to tell them it was finally safe to come back. They were bemused to discover that a nation of rocks and seaweed had not technologically advanced an inch between 1600 and 1890. "They were carrying their kids in baskets and just chewing on hunks of moss, or some similar, strange vaguely green-ish substance," said representative Dan O'Donnell, who recounted his firsthand experience with the Aran Islanders in an official report to the Dubhlinn Tymes, "I asked the wives and children where all their husbands were, and they told me that the men had all gone out on the communal canoe to catch a fish and would be back in two weeks. You'd think they had been living under a rock for all those years, but the rock was actually living under them." A typical Irish poet who loves rocks. Since the official report, the Aran Islands have transformed into a makeshift zoo displaying the traditional customs of Irish life and language. Due to the islands' idyllic rockiness and complete lack of natural resources, the economy of the Aran Islands hinges upon tourism. It is annually flooded by poets and prosets in search of lost words and inspiring metaphors hidden inside the mossy cracks and rustic villages that dot the island. Perhaps the most distinguished alumni of so-called Aran University is poet and playwright J.M. Synge, who journeyed to Aran on the advice of W.B. Yeats, who had never been to the islands but needed to distract Synge so he could screw his girlfriend. Synge's memoir of his travels pulls a remarkable amount of something out of nothing, detailing walks along the cliffs down to the smallest dropping pebble, conversations with the village elder down to the smallest fiber of his beard. While Synge discovered the natural energy that contributed to his ensuing fame in Irish literary circles, Yeats rode his wooden canoe all over Synge's soon-to-be-ex in one of Irish history's few win-win situations. For those without comedic tastes, the self-proclaimed experts at Wikipedia think they have an article about Man of Aran. When more natives began leaving the island in search for more habitable habitats, something had to be done to preserve Aran culture. 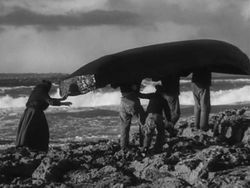 In 1934, using a primitive camcorder imported from Galway, ten of the remaining twelve Inishaan villagers produced, directed, and starred in Man of Aran, a propaganda film championing the tough Aran lifestyle. From a joyous feast of muddy wood with a dash of mold, to the tragic shipwrecking of their last canoe, the film chronicles a day in the life of the typical (and, by the time principal photography was complete, only) Inishaan family. The audiovisual parade of triumph, misery, and even more misery was a hit at the Irish box office, drawing larger crowds of poets than ever seen before. However, it failed to attract any permanent residents, and the number of Arannies dwindled into oblivion in the ensuing decades. It is now inhabited entirely by crouching metaphor hunters who, daily, mistake each other for simple peasantry. This page was last edited on 29 June 2012, at 04:26.